I picked out a few unposted photos for the City Views series to last until the beginning of next week. 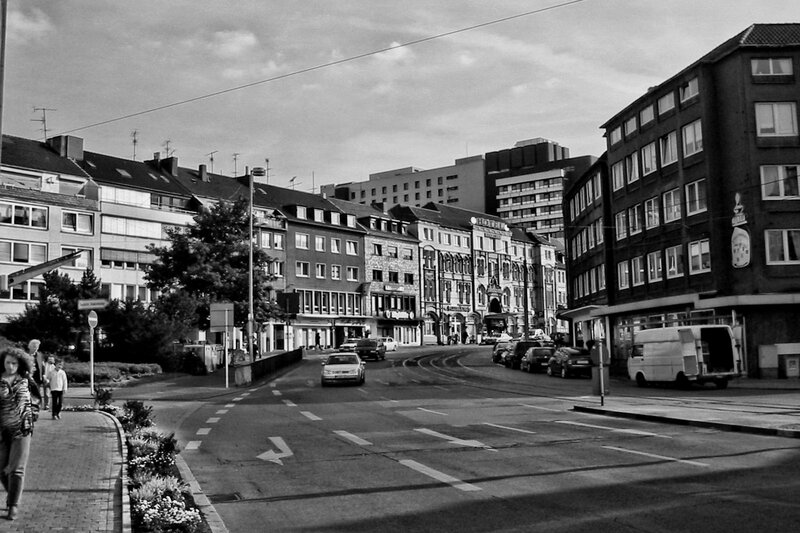 This is the beginning of Mülheim’s Friedrichstrasse right after the Berliner Platz. In the background you can see the huge hospital building looming over the city and the last building before the road goes around the corner is the famous Hotel Handelshof. The house was built in 1906 and was originally a sort of community center of the protestant church, but was turned into a hotel in the 1930s and has been in the hands of the same family for three generations. Someday I really have to take a better photo of the building, but it’s in a corner of the city I rarely get to today. This photo was taken in September 2003, but it should look about the same today.